A Celebration Of The Risen Lord. 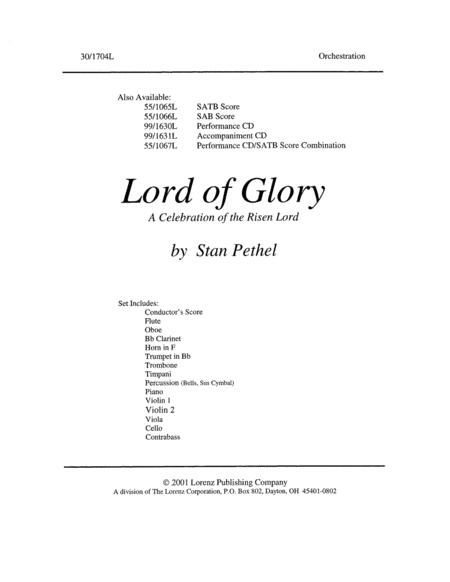 Composed by Stan Pethel. Choral Cantatas. Easter. Orchestral Score and Parts. 173 pages. Lorenz Publishing Company #30/1704L. Published by Lorenz Publishing Company (LX.30-1704L). The joy and celebration of the risen Lord are depicted here in an exciting new work for SAB Choir and Narrator. A blend of original music and new arrangements of popular hymns, including What Wondrous Love and Lead Me to Calvary, Lord Of Glory achieves an excellent balance of sensitive narration underpinned with a sense of excitement throughout the telling of the familiar story. The highlight of the work is the title song, which brings the cantata to a close in rousing, 6/8 fashion and is sure to have the congregation leaving with the refrain of praise the risen Lord on their lips. Flute, Oboe, Clarinet, Horn, Trumpet, Trombone, Timpani, Percussion (bells, sus cym), Violin 1/2, Viola, Cello, Contrabass, Conductor's Score.